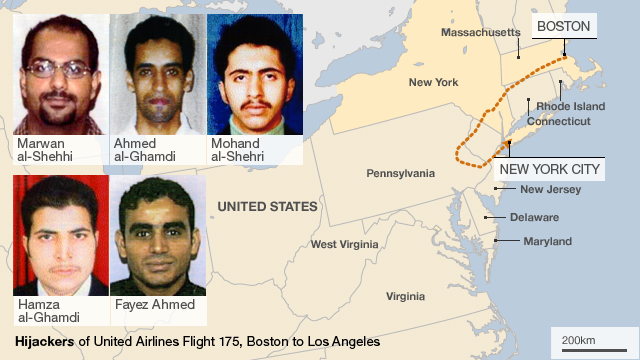 On Tuesday, September 11, 2001 nineteen terrorists affiliated with al-Qaeda hijacked four commercial passenger jet airliners. Each team of hijackers included a trained pilot. On the morning of Tuesday, September 11, 2001, a lot of people were going to be late for work in New York City, which for many started at 9:00 a.m. or later. It was the first day of school for many local children and it also was a primary election day in New York. The weather was clear and comfortable with little wind to speak of, so some took time to do early morning errands. 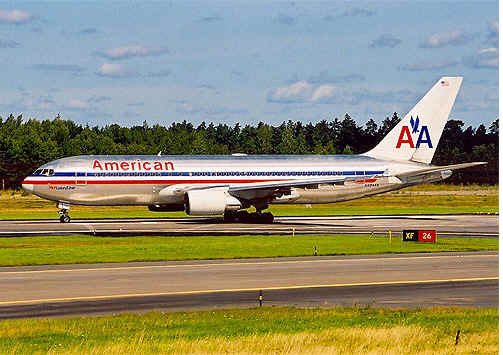 As a result, only about 8,900 of the typical 20,000 people were in WTC 1 shortly before 9:00 a.m. At 8:46:30 a.m. EDT, five hijackers flew American Airlines Flight 11 (AA 11) with 11 crew and 76 passengers into the north face of WTC 1. 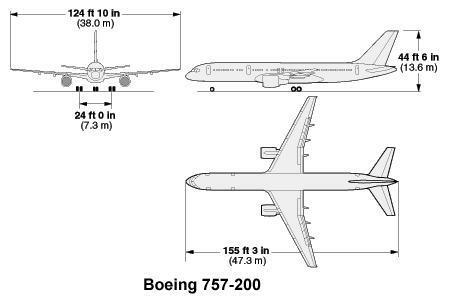 The Boeing 767-200ER was a twin-engine, wide-body aircraft, 159 ft 2 in. long, with a wingspan of 156 ft 1 in. Empty, it weighed 183,500 lb. It could carry 181 passengers in its three-class seating configuration and 23,980 gal (158,200 lb) of jet fuel as it covered its maximum cruising range of 6,600 miles. The maximum total weight the plane could carry was specified at 395,000 lb; the typical cruising speed was 530 mph. 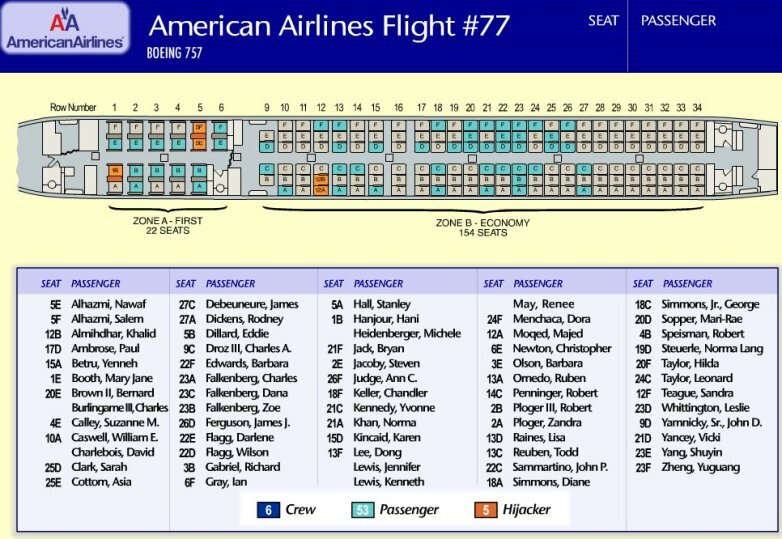 On that day, AA Flight 11 was much lighter. Bound from Boston for Los Angeles, some 3,000 miles away, it carried only about half the full load of jet fuel. 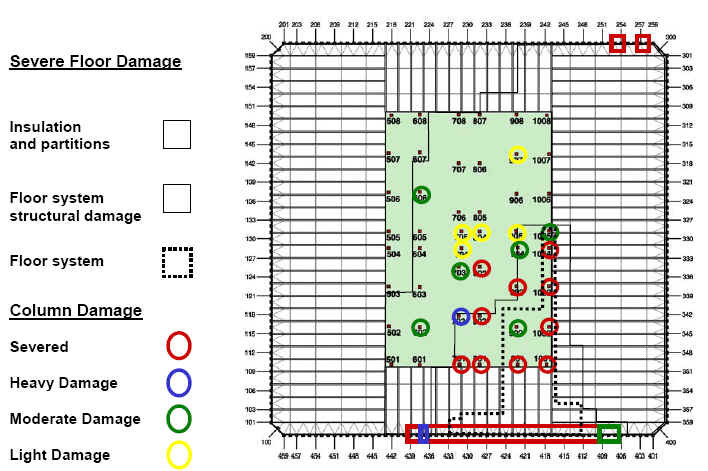 When it hit the north tower, it likely contained about 10,000 gal (66,000 lb), evenly distributed between the right and left wing tanks. 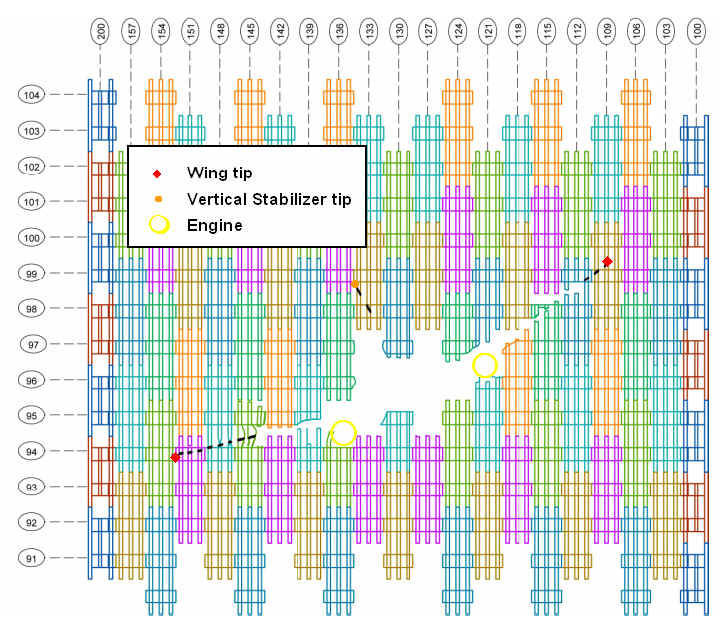 Because of the tight maneuvers as the plane approached the tower, the baffles in both tanks had directed the fuel toward the inboard side of each wing. The passenger cabin was more than half empty. The cargo bay, carrying less than a full load of luggage, contained five tons of luggage, mail, electronic equipment, and food. The total weight of the aircraft was estimated to be 283,600 lb. 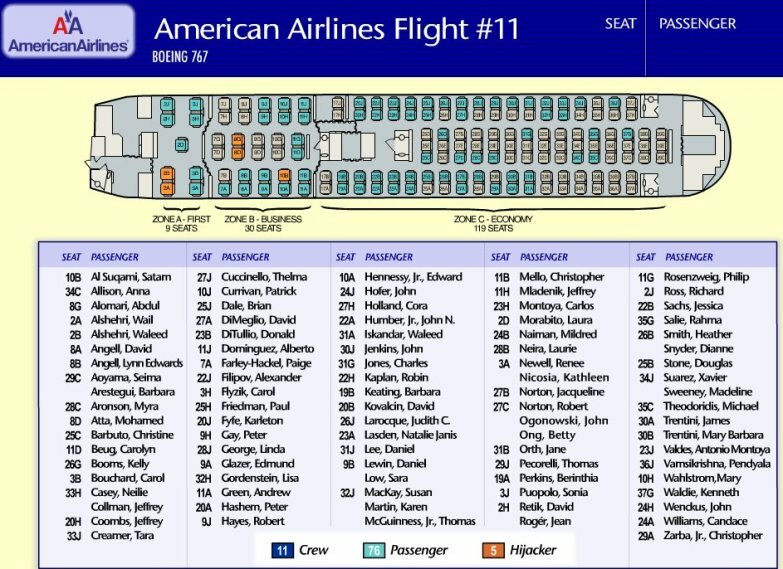 Killed: 92, including nine flight attendants and both pilots, plus many others in the tower. 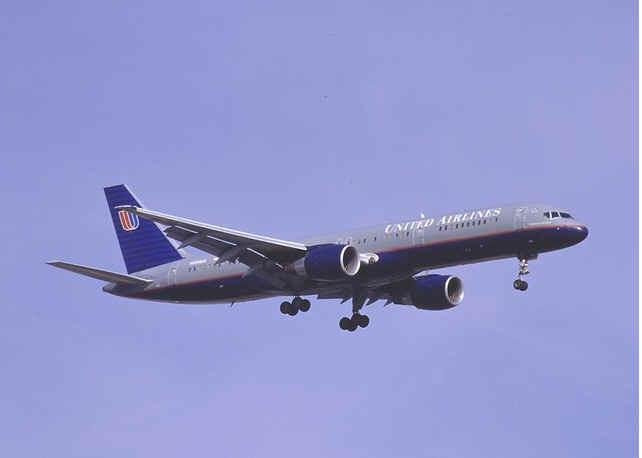 The Boeing 767 from Boston to Los Angeles, departed from Boston's Logan airport at 07:59 EDT. It hit the north tower between the 95th and the 103rd floor. There were no survivors among the 1,355 people who were on or above the 92nd floor. The aircraft had destroyed all egress paths downward, and roof rescue was impossible. Of the roughly 7,545 building occupants who started that morning below the 92nd floor, all but 107 escaped the building. Those left behind were trapped by debris, awaiting assistance, helping others, or were just too late in starting their egress. 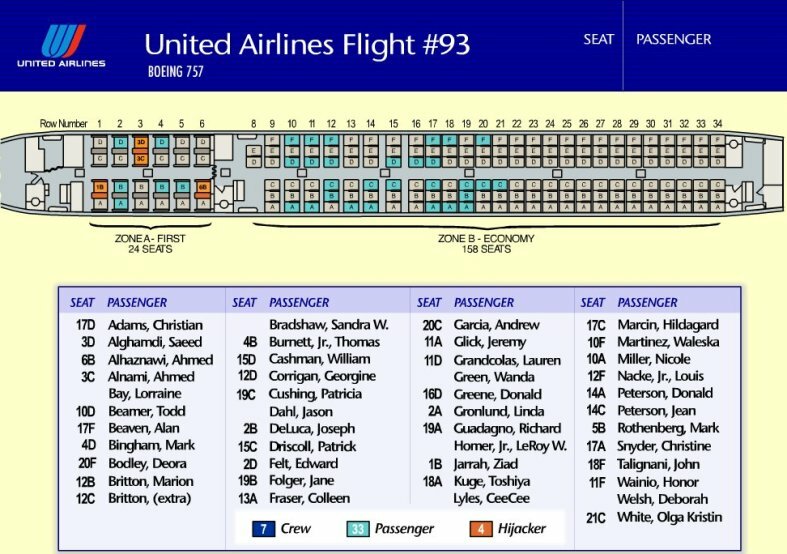 Sixteen and a half minutes after the first impact, five hijackers flew United Airlines (UA) Flight 175, with 9 crew and 51 passengers, into WTC 2 at about 540 mph, about 100 mph faster than AA 11 . 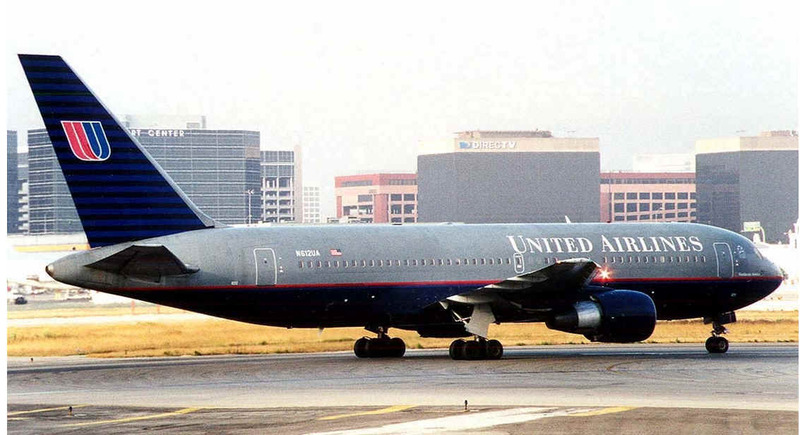 UA 175 was also a Boeing 767-200ER and had also left Boston, bound for Los Angeles. It flew into WTC 2 carrying about 9,100 gal (62,000 lb) of jet fuel, evenly distributed between the inboard portions of the left and right wing tanks. The cargo bay held about nine tons of luggage, mail, electrical equipment, and food. Combining this with the combustible cabin materials and luggage, the plane brought about 14 tons of solid combustibles into the tower with it. 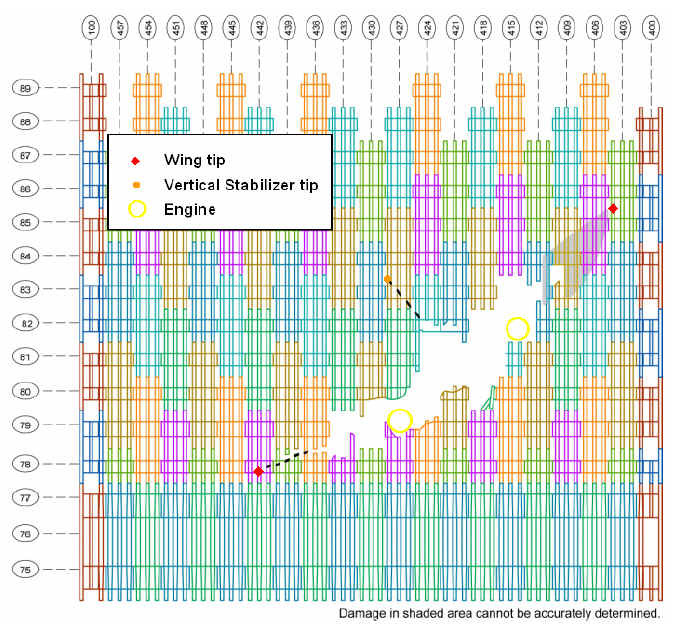 Simulation of aircraft impact damage to the 78th through 83rd floors in WTC 2. 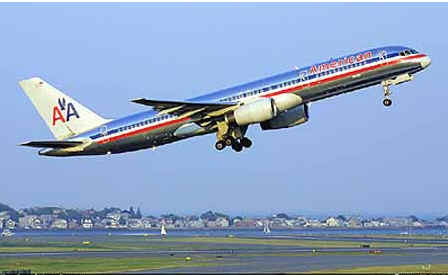 The second airliner crashed about 15 minutes after the first. 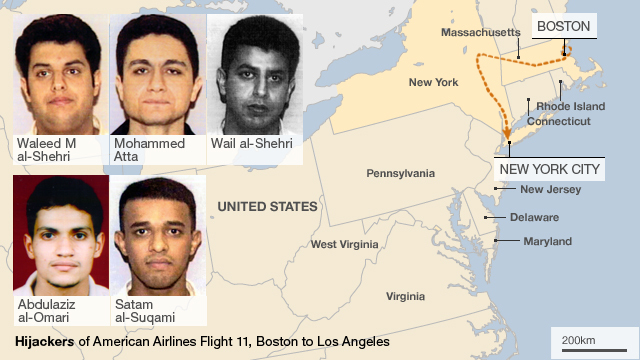 It left Boston's Logan airport at 08:14 and was en route to Los Angeles when it was hijacked. 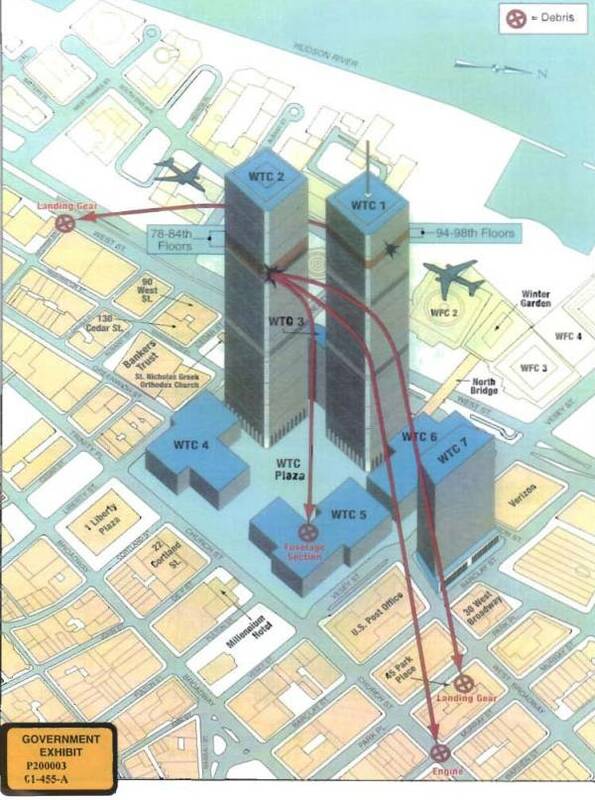 It hit the south tower at about the level of the 80th floor. 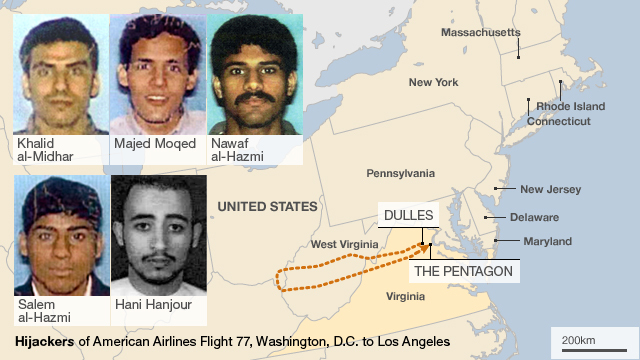 The third plane, a Boeing 757, took off from from Dulles Airport, Washington, at 08:10 and was en route to Los Angeles when it was hijacked. It was seen approaching Washington from the south-west. Just a few miles outside the city it made a 270 degree turn and lined up on the Pentagon. 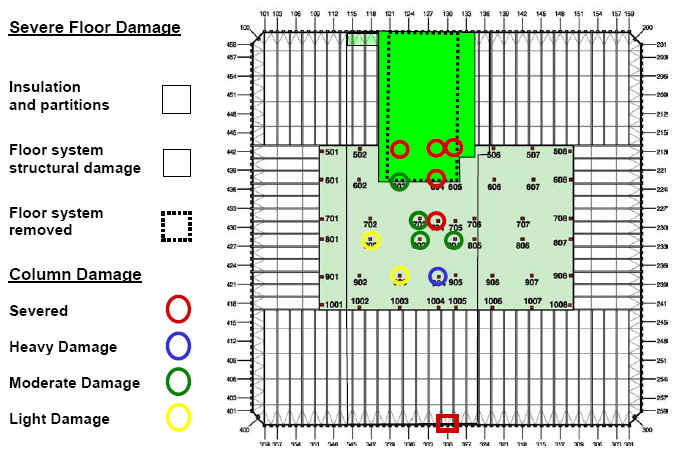 The impact and resulting fireball caused a five-storey section of the building to collapse. 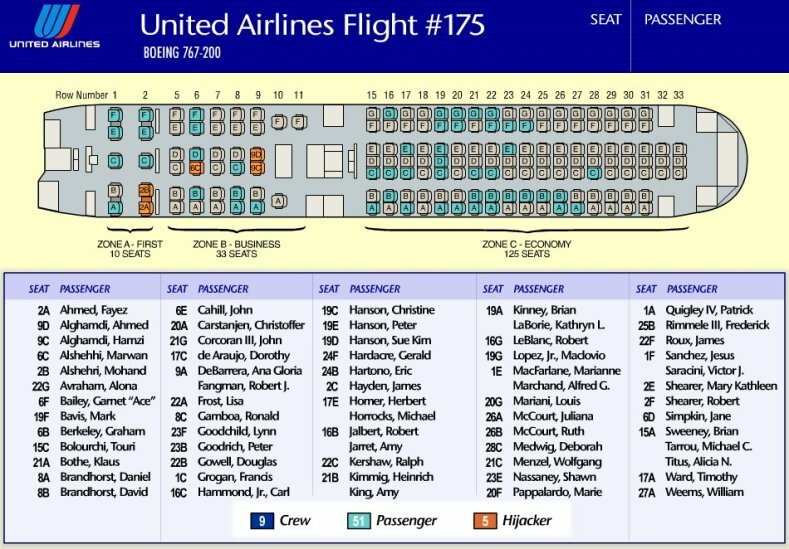 Flight 93, a Boeing 757, took off from Newark, New Jersey, at 08:42 bound for San Francisco. It crashed into the rural Somerset county in Pennsylvania.